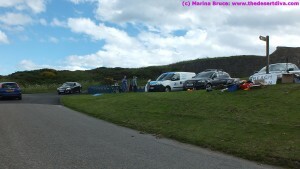 A Grand Day Out In Aberdeen….and All For Free! The Granite City has long had a reputation as an expensive place to live – it’s well deserved, we should know as we used to live in the region. Meanwhile, Aberdeen citizens, known as Aberdonians, also have a reputation of having “short arms, deep pockets” and no, we are not misers, just “canny” with our cash. If we can find something good/interesting/entertaining to do without emptying those pockets then we are delighted, so you can imagine how chuffed I was to fill my day with 3 such activities. 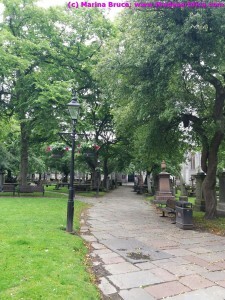 First stop was the St Nicholas Kirk (Church) Graveyard – not an obvious choice of location to while away an hour or two, but if you have any interest at all in the rich history of Aberdeen then it is well worth a look. The great and the good of the 18th and 19th century are interred here and you can “dig up” quite a few of them on Wikipedia. There are pointers to Aberdeen’s maritime past as you wander past graves of captains, merchants and shipbuilders – there is even an artic explorer, William Penny. 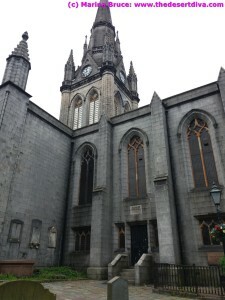 Alongside poets and printers lie engineers and architects, such as the great Archibald Simpson, who designed so much of Aberdeen’s stunning granite architecture. Aberdeen has long been a trusted seat of learning and there are quite a few professors and deans lying here as well as a few doctors; Alexander Gordon (eventually) won wide acclaim for his work on puerperal fever and you can still read his paper on the BMJ (British Medical Journal) website. 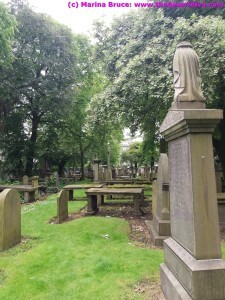 A number of years back I remember setting a treasure hunt for a group which included a stop at the St Nicholas Kirkyard and one clue was to find the grave of a “Wizard who loved his mother”. Check out the magician John Anderson’s grave (number 69 on the walk) to see why. The final grave I will note is for philanthropist Elizabeth Crombie Duthie who generously donated the lands where the Duthie Park now sits. 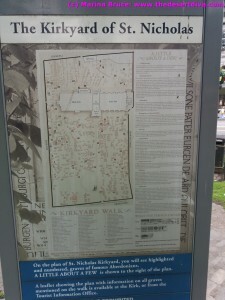 You will find information about the graves as well as a suggested walk/trail at both the Union Street or Schoolhill gates. If your kids (or even your husband) are interested in history, why not take them here in the school holidays to see what you can uncover! 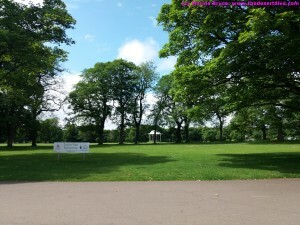 Our next stop is the aforementioned Duthie Park, which is an all-year-round attraction for all weathers too. Yes, really, thanks to the wonderful David Welch Winter Gardens, originally established in the 19th century but rebuilt after a storm in 1969, you can meander through tropical and cactus gardens as well as spotting some rather large goldfish. Currently the main café is undergoing refurbishment but there is a counter selling hot drinks and snacks. If it is a nice day then the whole park is worth exploring – playparks for the kids, walks, monuments and even a bandstand. Duthie park is located a couple of miles inland, on the banks of the River Dee and it is this waterway you should follow eastward to discover our last stop for the day. At the mouth of Aberdeen Harbour, the principal port for the Oil and Energy industry in Europe, you will often find dolphins, sometimes just swimming with the tide, catching fish washed down to see by the River Dee, and occasionally, riding the bow waves of the huge supply vessels which supply many of the hundreds of oil platforms drilling for oil in the inhospitable North Sea. This busy busy harbor has become home to some of nature’s most intelligent and delightful creatures and you have a fairly high chance of seeing them. Apparently there is no rhythm to their appearance and you will find them at this point all year round regardless of high or low tides: you may wish to don thermal clothing and a very warm hat in the winter; the weather can be mild with a light breeze at the Duthie Park and cold and blustery out at the Torry Battery (and that’s just in the summer!). Pop along during the summer (up til 20th August) between Wednesday and Sunday from 11am to 6pm (weather permitting) to visit the Dolphinwatch Project, an RSPB initiative which helps you get the most out of your time there. They have a host of information about dolphins, not just the Aberdeen ones, but of other pods around the UK, and will lend you binoculars if they are too far out to sea to see! We saw dolphins on our visit – Dolphinwatch told us they see them around 85% of the days the project is open – but they were too far out to get decent photos of them, so we snapped some of the harbour traffic instead. However I am pleased to bring you these lovely pictures courtesy of the RSBP. Back in the 1980s my husband and I used to work not far from Torry and often used to spend our lunchtimes watching the shipping come and go from the harbor – the dolphins were nowhere to be seen then, and you never know they might just disappear again, so I urge you to go and see them as soon as you can! Another RSPB attraction worth visiting, about one hour from Aberdeen is Fowlsheugh and you can read about our 2015 visit here.